Sussex booked their place in the quarter-finals of the FL t20 as they claimed a six-wicket victory in a rain-interrupted game against Surrey. The hosts reached 106-6 off 16.2 overs with Zander de Bruyn unbeaten on 30 not out before rain ended their innings. Sussex were set a revised target of 109 off 15 overs and eased to their target, scoring 110-4 with 20 balls to spare. 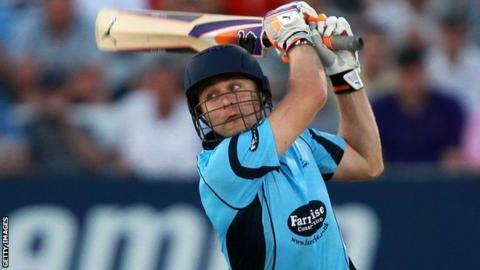 Luke Wright (32), Matt Prior (25), Chris Nash (22) and Murray Goodwin (18) helped Sussex to their winning total. Spinner Gareth Batty (3-11) gave Surrey a chance by claiming the wickets of Prior, Wright and Goodwin but Surrey's score was comfortably beaten. Surrey remain bottom of the South group as they suffered their fifth defeat in seven T20 games. Kevin Pietersen, dismissed for a first ball duck against Hampshire on Monday, could only score eight, while Jason Roy, Zafar Ansari and Matthew Spriegel also struggled.